There’s been a partisan split on climate change among Americans for a while now. But a new Gallup poll shows that the gap is growing. At the same time, Americans (those who believe in climate change, at least) have never been more sure global warming will pose a risk in the near(ish) future. All this is happening against a political backdrop where President Donald Trump has turbocharged partisanship, and a scientific backdrop of increasingly dire warnings. This is a bad combination. The split isn’t being driven by one party. Rather, Democrats are increasing concerned about global warming, while Republicans are sliding deeper into denial of its existence and the threat it poses. Specifically, Democrats increasingly view global warming as already here (accurate), and believe that it will pose a serious threat in their life time (also accurate), compared with the 2017 annual survey. Meanwhile, fewer Republicans think global warming is happening already (not accurate), and fewer think scientists agree it’s happening (it most certainly is, and scientists are still in agreement on that). But because nothing is simple, concern that global warming will pose a serious threat in our lifetimes hit an all-time high in 2018, and the percentage of folks who worry about global warming remains near last year’s record high, as well. The widening gap in how we view global warming can be traced to a few factors, according to Gallup. Donald Trump is the most obvious culprit. Climate denial has been a pretty mainstream Republican position for a while now, but Trump has brought it to the White House, with dumb tweets and rhetoric that have basically given the go-ahead to rank and file Republicans to doubt basic science. 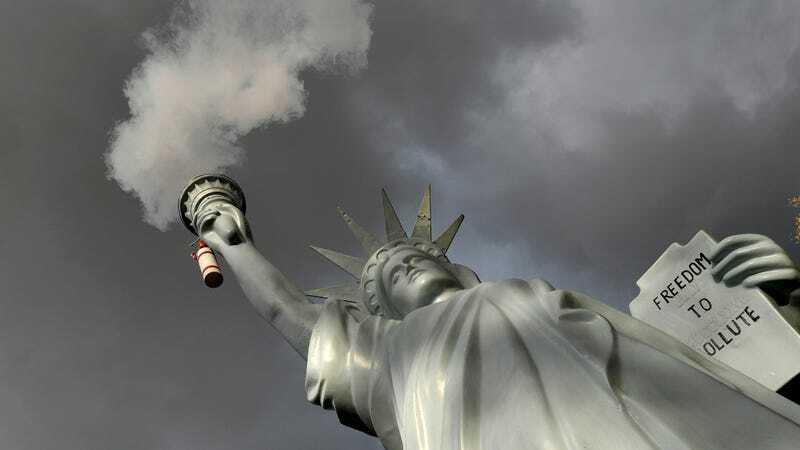 His efforts to rollback Obama-era climate policies and his intent to take the U.S. out of the Paris Agreement have also been met with strong condemnation from Democrats, and liberal tears are in high demand from conservatives, further egging the divide. At the same time, Trump’s retrograde views and policies may have spurred more Democrats to be concerned about climate change, according to Gallup. This, of course, has not spurred national Democrats to come up with any unified message or policies to address climate change ahead of the upcoming midterms. Interestingly, independents also reported an uptick in climate denial. That could be because the president’s views set the agenda, or perhaps because more Republicans are identifying as independents and taking their beliefs with them. If there’s a sliver of good news, it’s that concern about the impact of global warming in Americans’ lifetimes has never been higher. Across all Americans, 45 percent of respondents believe global warming poses a serious threat in their lifetime and 43 percent of respondents worry a great deal, just two percent shy of the all-time high set last year. Last year’s record run of hurricanes and wildfires likely raised concerns, as did the fact that it was the second-hottest year on record after three years in a row of global heat records. There’s still a huge partisan gulf, though with Democrats who worry about global warming outnumbering Republicans by two-to-one. There’s no denying our current politics around global warming are deeply fucked at a time when we need to be doing more to address carbon emissions at the root of the problem. While Donald Trump is both a driver and a symptom of the current divisiveness around that, let’s not forget who set the tone. The memo’s advice turned out to prescient. Years of messaging and tons of money have ensured that today, Republicans are the only major political party in the developed world that questions or denies the science of climate change. Outside of the Iraq War, this is perhaps one of the most lasting impacts of the Bush years. And it appears its impact will last long into the future. This article has been updated to clarify what while fewer Republicans think scientists agree climate change is happening in 2018 versus 2017, scientists’ agreement on the matter has not changed.